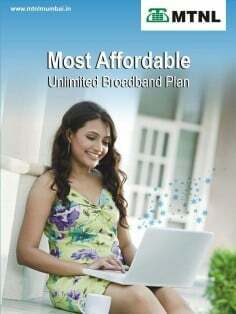 Leading Broadband Service provider Mahanagar Telephone Nigam Ltd (MTNL) today announced the launch of promotional 2 Mbps Fair usage Unlimited Broadband Combo Plan-499 for its customers in Delhi telecom circle. MTNL Delhi’s 2 Mbps Fair usage Unlimited Broadband Combo Plan of Rs.499 will provide 2 Mbps downloading Speed up to 4 GB and thereafter speed will be 512 Kbps for further Unlimited data usage. The Upload speed will be 512 Kbps. With this plan, MTNL also providing rent free landline connection with CLIP instrument. If customer opt MTNL Modem for Broadband services than initial upfront charges for WiFi Modem (optional) will be just Rs.300 (one time). The above new plan will be available for 30 days w.e.f. 26.10.2012 to 24.11.2012 on promotional basis in Delhi circle.For more details dial 1500 /011-22221500 (toll free from MTNL). THE MTNL SERVICES ARE PATHETIC . IN FREEDOM 795 PLAN A DOWNLOAD SPEED OF 2 Mbs WAS PROMISED UPTO 8 GB .AND 512 Kbs ,THEREAFTER ,UNLIMITED . HOWEVER THE THE SPEED NEVER ABOVE 1.2Mb and after wards it is only about 370 KPS. THANK YOU . NOW YOU HAVE INTRODUCED NEW PLANS . THE SPEED OF DOWNLOAD HAS GONE DOWN FURTHER ,TO 1 MB,FOR UNLIMITED PLANS . I THOUGHT THERE SHOULD HAVE BEEN PROGRESS ,& THE DOWNLOAD SPEED OFFERED SHOULD HAVE GONE UP TO AT LEAST 4 MB . MERA BSNL MAHAAN.